Snow is one of my favorites of nature’s gifts and pretty much the sole reason I love winter. In NYC, however, we rarely get to enjoy it to the fullest because the moment it starts to fall, the city officials start spraying the streets with salt, resulting in slush which pools around the sidewalks, making jaywalking next to impossible. A New Yorker who can’t jaywalk is nothing more than a tourist, so I dug out the Sporto Dylan duck boots from the back of my closet, where I promptly placed them the moment I received them from my mom a few years back. She bought them, thinking I could use them in the bad weather that comes our way, but I stubbornly refused to wear them, deciding they were too ugly for my usual outfits. Now, I strongly believe in challenging my beliefs, especially when they appear limiting and stubbornly-defended, so on this crisp post-snowstorm morning I decided to create an outfit around these booties that could pass the fashionable Sabina-dar. I wanted to stick with a dress (if it’s a challenge, let’s make it count! ), but I didn’t really have any that matched the booties exactly, so I started looking for something that can be the uniting factor. 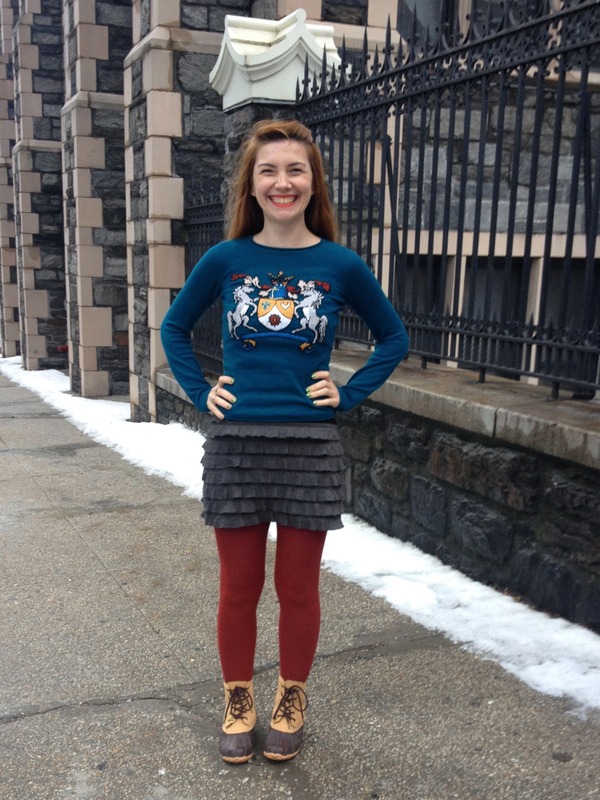 The blue Callixta cashmere sweater proved a perfect match, its coat-of-arms emblem encompassing many different colors, including that of the booties. Keeping it within that color family, I chose the frilly gray Poetry minidress that I wore under the sweater, making it look like a skirt, and finished it off with the rusty-red sweater tights. As soon as this photo was taken I was back in my warm and snuggly red puffy coat, rushing off to see my friend Amanda in an all-female production of Othello at the Harlem Shakespeare Festival. Lisa Wolpe directed it and played Iago – easily the best portrayal of that character I’ve ever seen. Listening to her whisper into Othello’s ear, planting seeds of doubt and fear and cultivating them into a complete destruction of everything that mattered, made me think of all the voices we all have in our heads, doing the same to us on a daily basis. Our own inner Iagos, telling us little lies and filling us with fear that inevitably consumes all our dreams and desires. This idea stayed with me as the week progressed and I made it a point to listen carefully for my Iago’s soft whisper, remembering not to follow in Othello’s footsteps, no matter what.